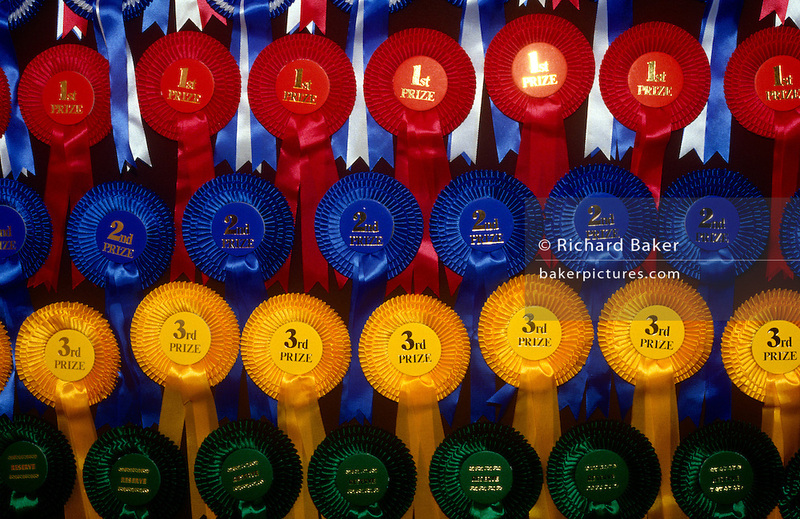 Before finalists take part in their last exercises at a gymkhana pony competition, these rosettes prizes seen here in close-up detail wait to be claimed by young winners and losers. From the top we see prizes for Reserve Champions then those for 1st prize, then second, third and runners-up at the very bottom. Such accolades are won and lost by fractions of a second but their importance is remembered for years afterwards as young girls desperately practice to improve their equestrian skills. A huge commitment is needed by the girls and their parents who spend great deals of money and time for these treasured prizes which can be won or lost by fractions of seconds or single points. Those that fail to win go home feeling empty-handed or perhaps cheated out of victory and glory. Those who win hang them on bedroom walls for years to come.